This is a great fun set for your little one. 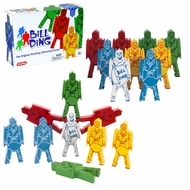 With endless configurations you can have endless fun with the classic Bill Ding Stacking Clowns. A toy that has stood the test of time Bill Ding originated in the 1930's and continues to be a favorite for those who remember. They can be stacked head to head. Great for fine motor skills and eye/hand coordination.